The new Deus Ex: Human Revolution game will help us all learn to love cybernetics. Over a decade ago, the video game Deus Ex was remarkable for its blending of numerous game genres, emphasis on player choice, and depth of storyline, which earned it the title of “Best PC Game of All Time” by the recently defunct PC Zone magazine. Now, a much anticipated prequel looks to rival its predecessor’s many awards. Deus Ex: Human Revolution is set in the year 2027 at a time when mechanical augmentation of the human body is common and the player must make critical decisions to progress through the rich story as enemies respond to even subtle player decisions. Set to release on 8/23/2011, the third game of the Deus Ex line must compete with many other groundbreaking game 2011 releases in order to hit #1 on everyone’s annual Top 10 lists. So, its developer Square Enix raised the bar on marketing the game as well. It created a faux technology company, Sarif Industries, and produced a marketing video (notice that it doesn’t even mention the game). Furthermore, an engrossing and interactive website has been created, which is profiled below. Clearly, Square Enix could have capitalized on the original to market the game, but the video game industry has changed a lot in the last ten years. Though the annual revenue of computer and video games is now over $10 billion worldwide, this is significantly lower than projections that were made earlier in the decade when 10% annual sales growth was conservative. The economic downturn, competition for entertainment from sites like Facebook, Twitter and YouTube, and the rise of free, mobile, online, social, and handheld games are just some of the factors that have made the industry a tough place to turn a profit. At the same time, gaming consoles have not only become more powerful, but new technologies like the Wii’s motion control system and the controller-free Kinect for the Xbox 360 have revolutionized not only the games but who is gaming. 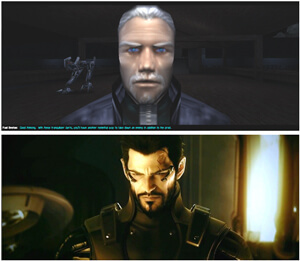 The new Deus Ex gameplay will come a long way from the 2000 original (top) with all its theatrical glory (bottom). To grab gamers’ attention in this market, Square Enix is wisely capitalizing on the viral nature of the web to tantalize players about Deus Ex: Human Revolution. And it seems to be working. Over at IGN, Deus Ex: Human Revolution is on the top 10 Most Anticipated games of 2011 for both PC and Xbox. But more than just a cool advertising campaign for an awesome looking game, the Sarif Industries website is a forward-oriented summation of many of the projects that have been discussed on Singularity Hub over the past few years. In fact, many of the proposed products on the website have real-life technologies that exist today, albeit in their cruder 2011 forms. While heads-up displays are on every technologist’s wishlist for cybernetic eyeballs, the proposed Eye-See device looks like what we would expect from a future synthetic eye: something that fits right into the eye socket and wires directly into the optic nerve. Compare this to the Implantable Telescope Technology from CentraSight that was profiled last year on the Hub. Although the telescope implant enhances central vision at the expense of peripheral vision, it enables those who suffer end-stage age-related macular degeneration to be able to see again. It is only a matter of time before the technology improves, allowing the elderly to regain the ability to read. The fact that the brain continues to be pliable to new vision technology really opens up the potential of something like the fictitious Eye-See technology to be available sooner than later. The resilient, nanotube-weaved design of the hypothetical hand prosthetic is exactly what any person considering cybernetics would love to have someday. Toward that end, the BeBionic hand from RSLSteeper is a step in the right direction as is the i-Limb hand from TouchBionics and the Smart Hand project. As the prosthetic hand space gets crowded with an increasing number of innovations, something akin to the hand prosthesis dreamed up by Square Enix is quite promising. Lost for words at a party? Serif Industries offers a solution: CASIE is a cranial implant that gauges a persons’ body language than enhances your response while projecting information on your cybernetic eyeball (above). While some would love this device to be able to persuade others, people who have experienced trauma and are literally trapped in their bodies often have to resort to very subtle cues to be able to communicate. But technology like the Braingate Neural Interface from Cyberkinetics is making strides at connecting mental thoughts into actions on a computer screen. Extend this kind of technology on a long enough timeline and implants that readily interface with the brain for enhancements to various functionalities will most certainly become reality. In the upcoming Deus Ex: Human Revolution game, having a cybernetic arm prosthesis seems very appealing. The Square Enix developers imagined a prosthetic using advanced polymers including myomers (electro-stimulated cables) working in concert with micromotors. While not nearly as sleek looking, efforts toward an arm prosthesis are very bright as the DARPA-funded Module Prosthetic Limb system is now in clinical trials. This technology underscores that we are literally on the verge of a massive revolution in prosthetic devices, ushering in Cybernetic Society 1.0. As you can see from this profile of what the Deus Ex developers envision will be available 16 years from now, augmentation technology is rapidly advancing on a number of fronts. Games like the Deus Ex series allow us to project technological advancement into the future, not only to stimulate out ingenuity and imagination, but to help us reason through the potential consequences of seemingly innocent advances. That we are so close to modifying our bodies with artificial prosthetics is both exciting and frightening, leaving no doubt that the singularity is indeed on its way. For a virtual playground of what our future holds, play around on the Sarif Industries website, check out the theatrical and gameplay trailers at the Deus Ex: Human Revolution website (I prefer the one over at Steam, perhaps because it lacks the NSFW URL), and pick up the game in August. It looks to hold that magical combination of story, plot, immersion, action, and atmosphere that make for a Game of the Year.